My grandfather Irving Porter Church had a small refracting telescope equatorially mounted on a pedestal in his backyard at 9 South Avenue in Ithaca, New York. I can remember it. Somewhere there is a small photo of him in a black frock coat standing beside it. In 1923 the 12-inch refractor of the Fuertes Observatory at Cornell University was named after Prof. Church, then retired chair of the Civil Engineering Department. In Manhattan, on Saturday, January 24, 1925 (about a week after I was born), there was a total eclipse of the sun. The southern limit of totality was found later that day to have been at 97th Street; observers having been stationed at every other block from 72nd to 135th Streets in order to make the determination. We lived then on West 113th Street, just within the zone where totality lasted only a few seconds. According to my father people had gathered outdoors despite the bitter cold and as the sun reappeared after the brief spectacle a burst of applause rolled across the rooftops of the city. My father later framed its picture cut from the rotogravure section of the New York Times. I remember, as a child of less than five, a night in Ithaca (probably in August) during which the grownups were to stay up until after midnight to watch a meteor shower (probably the Perseids). Despite a small tantrum I was packed off to bed as too small to stay up that late and I never saw a meteor shower until decades later. My father, being an engineer and a scientific sort, passed on to us as children a rudimentary interest in astronomy. In the ’30s, when we were ten, knowledge of the Universe was only a fraction of what it is today and didn’t extend in much detail beyond the Milky Way and the more distant galaxies and nebulae: Messier’s objects were still a mystery. The size and age of the Universe was essentially unknown and Edwin Hubble had hardly yet published his theory demonstrating its uniform expansion. We learned that the Milky Way was our own galaxy seen edge-on and came to recognize the Dippers, the Pole star, Orion and the Pleiades in winter, Lyra and Cygnus in summer. Around the house we had some elementary astronomical star charts and texts most of which I had eventually read. In July of 1932 there was to be a total eclipse of the sun visible on Cape Cod about noon, but not quite total in Boston—which was just west of the central line which swept south from Maine, over the tip of the Cape, and thence out to sea. My father had made reservations for the family on the Provincetown ferry. The ship was crowded with eclipse goers and hawkers offering smoked glass eye protection at outrageous prices. We had our own rectangular panels of heavily exposed photographic film (metallic silver was the agent) sandwiched between glass plates and taped around the edges. They had been made by my grandfather Church. We climbed to the top of the Pilgrim Tower in time to watch the eclipse from the belvedere. I remember only the brief phase of totality, the dark moon suspended high on the meridian surrounded by the ethereal halo of the sun’s corona. Much of the mathematics for solving the spherical trigonometry required of celestial navigation could be simplified by using tables prepared by the U.S. Naval Hydrographic Office (HO). The tables were hardbound in books and our particular method was designated HO-218. There were others suitable for various uses (HO-214, etc.) and one tedious, from scratch, by-hand method, requiring no tables, called the Ageton Solution—which we had to memorize. The HO tables were prepared in advance for a fixed set of twenty-two bright stars more or less evenly distributed over the celestial sphere so that, anywhere on earth at any time of night, one could identify and sight on at least three bright stars so spatially distributed as to permit three lines-of-position to be calculated for plotting on the chart. Thus I learned the names and positions of twenty-two stars many of which I would otherwise probably never have known of. Soon I was haunting the general astronomy shelf at the New York Public Library and, through the next year or so, read every book more or less in sequence down the length of the public shelf. I learned about making better telescope mounts, making parabolic mirrors, about solar eclipses and famous expeditions to study them, about transits of Mercury and Venus across the face of the sun, about astronomical photography, and the history of the great discoveries of the past. I read all three volumes of “Amateur Telescope Making” and most of Jenkins & White’s “Fundamentals of Optics.” I was hooked. Month after month (with the exception of the mirror), working in the bedroom and at my friend Lambert Mazzoni’s shop in a loft south of Houston Street, I gradually rebuilt the telescope and its insubstantial tripod ending with a versatile and sturdy mount with setting circles (right-ascension and declination) and driven by simple weight-driven clockwork to cancel the relative motion of the earth’s rotation during long viewing and photographic sessions. Lambert had a lathe and a drill press at the SoHo shop where I could turn wooden, Masonite, and aluminum parts and make simple cameras and accessories. By working at night I could use the kitchen of our apartment on West 108th Street and later on West 116th Street as a darkroom. My first real foray into photography was to capture some successful exposures of the transit of Mercury across the face of the sun on the seventh of November, 1960—photos taken from the roof at 300 W 108th St. I used the direct solar image of the 4-1/4″ reflector at a focal length of 3,000mm, a homemade camera box with a 2-1/4 x 3-1/4 roll film back, and Kodak Autopositive (super contrast) film slips cut to size from a larger sheet. The raw film had to “reversed” by exposure to bright light. After the beginning of the transit (which lasted about three hours) I could make an exposure, run down to the darkened (windowless) kitchen to develop the film, and skip back to the roof for another exposure with altered timing. Mercury was the tiniest of black dots against the image of the sun, much smaller than sunspots nearby (one of which was gigantic). Later the best negatives were printed with a simple enlarging rig made from an old wood framed bellows camera. There was a problem with “limb darkening” whereby the edges of the solar image were significantly less bright than the center. By winding up, and then letting spin down, an empirically adjusted dodge—an internally toothed annulus of cardboard suspended from an axial black cotton thread just above the projected image during the exposure—I could virtually eliminate the unwanted effect. [The 60 degree threads were moving and thus blurred, and the central thread was out of focus.] The best of these results was published in Sky & Telescope magazine in January of 1961 and reprinted in the 1962 McGraw-Hill “Yearbook of Science and Technology” (under “Planet, Mercury”). My attempts at comet photography began in 1959. At first with the 2-1/4 x 3-1/4 camera with eyepiece projection (tiny, tiny images bearing gross enlargement), and later with a new camera (independent of the telescope) assembled from an army surplus aerial lens of much longer (250 mm) focal length with a homemade 4×5 plate holder at the back and permanently focussed with a bright star (Sirius) using a knife-edge installed across a small hole made in the ground glass in the film plane. Eventually I added hand operated slow motion knobs to the right ascension and declination circle adjustments and red-light illuminated cross-wires to the guide telescope thus greatly facilitating the removal of driving clock errors in minutes-long exposures. The intermittency of the escapement gave a slightly muddy, halting motion to the clock. Among the earlier photos were Comets Burnham (1959k) from the roof at 300 West 116th Street, Seki-Lines (1962c) from Dobbs Ferry, NY, and later Ikeya (1964f) and Bennett (1969i) from the yard in Weston, Mass. Extraordinary! That was something I had to see, and the more I thought about it, something I had to photograph. It seemed, after some research, that it was something no amateur had yet done. So I set out to design and build a slitless (Rowland mounting) spectrograph; one that I could mount on my clockwork driven equatorial. (For the detailed description of the spectrograph see my article in Sky and Telescope, May 1970, “Gleanings for ATM’s,” p. 318). Usually, to obtain the spectrum of extended objects, a slit is required in the camera itself, but the thin crescent of this object acts as its own slit. A total eclipse of the sun would be visible in Maine on Saturday, July 20th, 1963. A design began to take shape on my drawing board where I worked at Speed-Park (things were a bit slow), and on weekends at Lambert’s loft in SoHo, and in the bedroom of the apartment on West 116th Street. I combed the junk shops on Canal Street for odd parts—my most serendipitous find: an old bulb-operated Packard shutter of the same 2-1/2″ aperture as the concave diffraction grating of 20″ focal length on whose aluminized surface was a 1-1/2″ square area ruled with 15,000 lines per inch. I had essentially finished the construction by the time we moved house from New York to Boston in June of 1963. That spring Sky & Telescope published my illustration of the sky at totality showing the stars and planets visible during totality. Then came final preparations in Cambridge and in my boyhood workshop at 85 Ledgeways in Wellesley Hills. Eventually I spent a last evening on the banks of the Charles River, the spectrograph aimed at the copious neon signage around MIT across the dark river in order, with a jeweler’s loupe, to confirm the focus across the entire length of the parabolic film arc. On the afternoon of the 18th with everything loaded into a new Ford van I headed alone for Maine to allow a day to find a good site and to set up. My friend John Thornton agreed to meet me on eclipse day to help out. I slept on the floor of the van amid the equipment. Sky and Telescope had predicted the best chance for clear skies at a site on an open hillside southeast of Pleasant Lake in Stetson Maine and virtually on the central line—for the longest possible period of totality. The central line swept down out of Quebec, across central Maine and out to sea at Cadillac Mountain on Mount Desert Island where there was fear of morning fog. John joined me on Saturday and we spent the morning checking over what I had set up the day before. The morning was nice; clear with drifting fair-weather clouds. Toward noon—the time of the eclipse—the cumuli increased somewhat but everyone (there was large crowd of astronomers and hangers-on strewn across the hillside) seemed optimistic. First contact came—the first nick out of the sun’s disk by the advancing moon—and we then had about an hour. Gradually the clouds billowed larger and filled a greater portion of the sky obscuring the sun for anxious minutes at a time. The sun would reappear (cheers) only to disappear moments later (groans) behind another majestically advancing mass of cloud. The time to second contact (my crucial instant) dwindled to minutes. The world was darkening rapidly; we began anxiously to guess the time when certain blue-sky “holes” would happen along. The moon now covered almost the entire disk of the sun. A minute to go; sun in the clear. I had a small plane transmission grating taped to one objective of my binoculars and I could see the dark Fraunhofer crescents beginning to condense out of the continuous spectrum of the photosphere. Hand on the shutter bulb, poised, tense. The dark crescents now sharpening, sharpening, scant seconds to go to the flash and then… All dissolved into grayness and faded into virtual night. The cloud took so long to pass that no one even saw the evanescent solar corona, except fleetingly through momentary thinnings in the mist. The rest of the afternoon was a beautiful summer’s day under a blue sky studded with lamb’s wool clouds. In Orono, at the University of Maine, it poured rain; on Cadillac Mountain, perfectly clear. The next total eclipse visible on the eastern seaboard would occur on Saturday, March 7th, 1970, the central line passing over Mexico City, leaving the coast at Norfolk, Virginia and grazing Nantucket Island on its way out to sea. This eclipse was part of the 19-year Saros series that included the eclipse of July 1932 that I had seen with my father in Provincetown. For six years the spectrograph gathered dust. In 1969 I began a new effort that I came to view as a running battle against Murphy’s Law. I dusted off the spectrograph, telescope, and clockwork and began to prepare for March 1970. I would lie in bed at night conjuring things that could go wrong, each time eventually finding a solution, and in the following days working it out. What if it should rain in the morning; what if there were wind? I arranged the equipment and marked the floor of the 9×9 tent. What if I couldn’t align the polar axis by the North Star the night before or at local noon by the sun? I installed a long surveyor’s compass needle in the main leg of the tripod. What if it were cloudy in the hours before the eclipse? I had calculated the sun’s right ascension and declination at eclipse time so that – once the polar axis of the equatorial mount had been set—I could aim the telescope in advance using only the graduated setting circles. What if the driving clock faltered (as it had in the past)? How could we fine-tune the guiding without a guide telescope (dangerous to the eyes)? And so on and on. Gradually it began to feel as though Murphy could be held at bay. My friend Frank Dow agreed to accompany me to Nantucket as sorely needed assistance. We set up in the backyard in Weston several times to go through our detailed routine against a stop watch. Frank controlled the guiding using the long tubular lensless sights and the R.A. and declination slow motions to keep the sun’s center always in the cross wires. My plan was to photograph the flash at second contact on Kodachrome film and at third contact on Kodacolor film by taping together the two cassette leaders and winding the film first back into one cartridge then into the other with cranks made from slotted wooden dowels tailored to fit the Kodak 35mm spools. I had a two-spool sample set up that I had used for design, testing, and practice. It was left over from Maine seven years before. There were to be about ninety seconds of totality between second and third contacts. During this time I would wind film and photograph the corona in color at 3,000mm focal length with the 2-1/4 x 3-1/4 eye-piece projection camera on the 4-1/4 inch Newtonian. We wondered what chance at all we had for good weather in early March. I had made ferry reservations for the car in December—the reservation clerk wondering why there were so many already booking for the sixth and seventh. The twins (9), Meg and Match, agreed to come too and I arranged a small telescope and camera on a tripod so that Matthew could take some pictures. During this period the children’s school teachers asked if I would come to their class to explain the eclipse. For the sun I used a blindingly bright photo-flood lamp about four inches in diameter mounted in a large black background sheet and for the corona I painted, on a piece of fly-screen, a diaphanous simulation on the background immediately around the “sun.” A foot or so in front of the sun and slightly larger I mounted a fixed opaque black circle—the “moon.” We set this up on a desk in the front of the classroom at about kid’s eye height and had the children walk slowly across the back of the room. From either side in the back the blinding glare of the “sun” was all that one could see—not the “corona” or even the “moon.” But, as the children walked along, the moon appeared to intrude on the sun’s disk until sudden “totality” in the center when the sun’s corona on the background could then easily be seen. Everybody liked it and I think the kids got the idea. The teacher dragooned the kids into writing nice thank you letters. Car packing time arrived. We were to leave early on Friday morning and to spend the night at a friend’s house (Julian Everett, an old Dreyfus colleague of mine whom I had visited there before) in Nantucket town. After having packed the instrumental stuff in Weston I assembled a variety of hand tools that I felt might come in handy in general and for emergency—keeping Murphy firmly in mind. Pliers, screw drivers, file, scissors, hammer, hand drill and bits, hacksaw, clamps, wire cutters, wire, tape, glue, oil, and a wood chisel among many others. As I left the workshop I lingered to take a last look around. My eye fell upon a little coping saw and, after a moment of hesitation, I tossed it into the box. The ferry dock at Wood’s Hole was teeming with activity when we arrived. I had heard that the passage was booked solid and, in spite of earlier confirming phone calls, I was worried a little about the confusion and getting a place in the vehicle line and actually rolling on board. But it sorted itself out and we set sail for Nantucket under sunny skies. Almost everyone on board was on his or her way to see the eclipse. Nantucket airport was undoubtedly recommended by Sky and Telescope as our observing site. The field, being on the southern side of the island, was just a little closer than the town to the central line of the passage of the moon’s shadow, which passed offshore to the south. There was no practical way of beginning the set up that day, although we did drive down to look over the site. Much pre-eclipse activity was already evident. Early in the morning we went to the airport. It was hazy but clear and the temperature was above freezing. We found a spot among the many other enthusiasts and the set up went according to plan. We erected the tent, aligned it with north, and set the telescope feet on pre-marked spots. After checking the compass needle in the tripod leg we made small adjustments and precisely at local noon (worked out in advance) we checked the alignment again with the shadow of a plumb bob. In the meantime the telescope and spectrograph were mounted, the image of the sun set on the camera’s ground glass and on the spectrograph’s direct-image cross mark (the “zeroth” order of the spectrum), and the driving clock was started. Finding a spare minute I set up the small telescope and camera for Matthew; a fixed alignment with a cable release on a 35mm Kodak Retina focussed on infinity. Fearing degradation from unforeseen light leaks I was loath to load film into the spectrograph unnecessarily early. But now, with about thirty minutes to go, that time had come. I took out the two cartridges, whose leaders had been joined, and set them into the film transport cavities on either end of the 9 inch parabolic film arc. I closed the back and latched it before the insertion the transport cranks from the outside. But, what’s this? They don’t fit? How is it possible that the wooden dowels are now suddenly MUCH TOO LONG? Seized by panic I was suddenly aware of the baleful presence of Murphy and his inexorable Law: “If something CAN go wrong; it WILL go wrong.” All else was banished from my mind. At home I had failed to try the new film cartridges in the instrument but now I realized that, almost unbelievably in the intervening seven years since Maine, Kodak had altered the 35mm cassette design! What on Earth to do? Only fifteen minutes left! And gradually, as the express bore down, it came to me: the coping saw! Frantically, in the rapidly gathering darkness I made some simple measurements, marked the dowels and, with the small saw, cut them to the new length and, crucially important, formed the small end-slots required to engage the fins in the cartridge spindles. Whew! Just in time and with only minutes to go I advanced the film, had Frank check the final alignments, and readied myself to watch the last seconds before second contact with the plane grating on the binoculars. Poor Matthew had been completely forgotten. It was as it had been in Maine with the difference that the sharpening, darkening Fraunhofer lines suddenly flashed out in brilliant color from red to violet just as Young had described in 1870. I squeezed the bulb and heard the shutter clack open and close in what I hoped would be about a fifth of a second. The flash blazed for about three seconds and faded; totality began; now ninety seconds to its end at third contact. The corona was beautiful, some stars came out, and everyone in the area fell silent. I wound the spectrograph film, counting crank turns until I knew the film from the second cartridge was in place and that film from the former safely returned to the other cassette. There was time to watch the spectacle and to make and wind several exposures at 3,000mm with the 2-1/4 3-1/4. Then, at third contact, the flash reappeared, facing the other way. I tripped the shutter again. rewound to expose again the splice. I think we may have opened a couple of beers. Al Doolittle, my friend from J&M, came by and took some pictures (one including Meg which was later to appear on the cover of Sky and Telescope magazine). The children wrote in the dust on the side of the van: “Eclipse, we made it.” Murphy had lost. That afternoon on Nantucket were visible an unusually bright pair of “sun dogs” made by light refracting from ice crystals high in the stratosphere. Perhaps it was an omen; for the film had yet to be developed. The Kodachrome spectrogram was beautiful (I had had a morbid fear that the processing lab would unthinkingly chop the continuous nine-inch strip into individual slides). 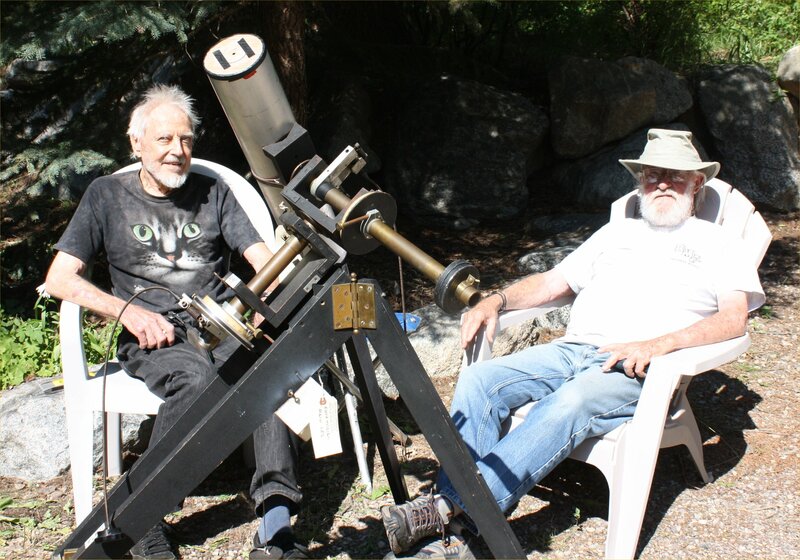 I called Sky and Telescope for a meeting and took it in to show Joseph Ashcroft and Dennis Milon. While I sat there S&T decided, for the first time ever, to publish a full color centerfold. The spectrogram stretched across both pages at the top (S&T, May, 1970). They asked me to write an article for the same issue on the instrument’s design and construction. Later I was invited by Dennis Milon to give a lecture at the Harvard Observatory library on the flash spectrum for the Boston ATMs (Amateur Telescope Makers) for which I prepared a fairly elaborate model to demonstrate what Young had seen in 1870. Ultimately the flash picture was published in several astronomy text books, some other magazines, a NASA publication, and was on display (greatly enlarged) for many years in the “Hall of the Sun” at the Hayden Planetarium in New York City. Life moved on. I did not realize it at the time but my “career” as an amateur astronomer had ended with the total solar eclipse of March, 1970. The telescope gathered dust in the basement in Weston for many years until the time came to break house and move to Cambridge in April 2017. I arranged to donate it to the Fuertes Observatory at Cornell University, and my friend John Reppy agreed to shuttle it from Weston to Ithaca. But it got one more outing, this year, when John and I decided to drive out to the Tetons to view the August 2017 eclipse.